With such a long day under our belt yesterday, we decided it would be best to sleep in today. I drove Scott, Erin and Grandma Mary to the train station around 10:30 and brought back a bag of Dunkin’ Donuts treats to entice everyone out of bed. Donuts can be very persuasive. Our first order of business was to get some shopping done. Our first stop was a hat store named Lids, that Miles wanted to stop in. This normally would not be noteworthy, but we all agreed that this was one of the friendliest stores we had ever been in. Probably no less than six people asked us if we needed help, but they did it in a way that was very friendly and not annoying. I told one of them how much I liked it, and she told me, “We make your dreams come true”. Lofty goals. Our next stop was H&M. In this store, Miles and I went up to the men’s department on the 3rd floor and the girls shopped on the 1st floor. We had been in the store maybe 10 minutes when the fire alarm started flashing. It didn’t appear that anybody was taking it seriously and everybody continued shopping. Finally, after at least five minutes, the employees started rounding up the customers and making everybody evacuate. While I did not see any mischief, the girls saw people grabbing merchandise and put it in their pockets. Also, a store employee told Stephanie that people were not even hiding clothes in bags, they would just carry them straight out of the store on hangers. With that experience behind us, we thought we would switch gears and do some sightseeing. We walked over to Grand Central Terminal. Miles had a tour guide earlier in the week that would get upset if you called it Grand Central Station. A “terminal” is a building where it is the end of the line for the train, while a “station” is a building that the trains will pass through. 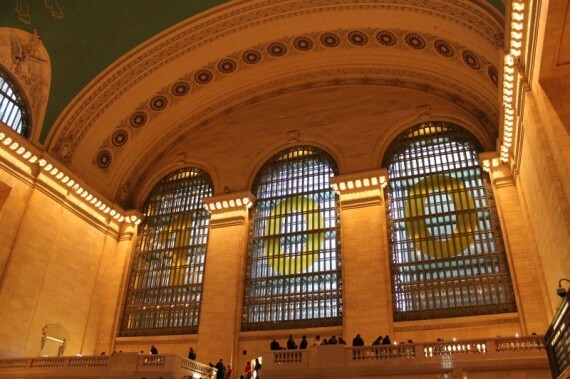 Grand Central Terminal celebrates 100 years. The main hall was cavernous, with a ceiling about 125 feet high. The ceiling contains a diagram of the constellations. The ceiling used to be completely black up until 1998, when a restoration project was started. They determined that the dark substance was not coal, but was from cigarette smoke. There is one small patch of the ceiling left untouched to highlight the dramatic difference. 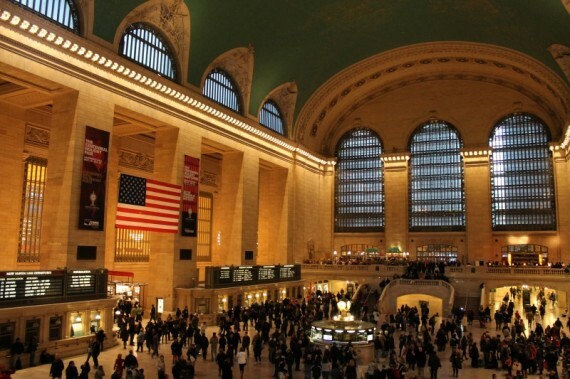 On the second floor of Grand Central, is the largest Apple store in the Western Hemisphere. One of the employees told me that during the holiday season, this store will average over 1 million dollars in sales per day. 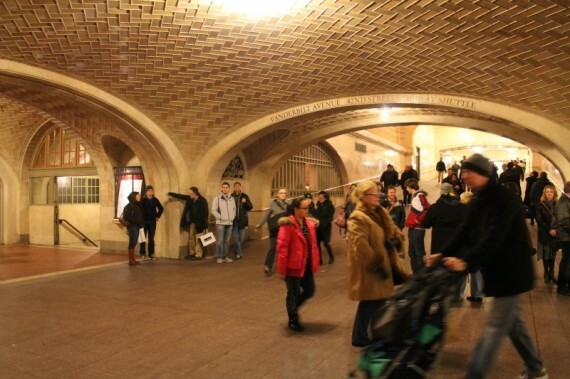 Another fun feature of Grand Central is the Whispering Gallery. Our tour guide on Tuesday told us about this place and it is located just off the dining concourse. The gallery has a low ceiling and the curvature is just right to allow a person to whisper in one corner and another person to hear it in the other corner. This despite the fact that the ambient noise level at Grand Central is significant. The Whispering Gallery at Grand Central Terminal. From there, we walked over to the Chrysler Building. There are a lot of great looking buildings in New York City, but I would have to say this is my favorite, highlighted by the arches on its crown. Not only did the building look beautiful, but it was the tallest building in the world for 11 months, until the Empire State Building was completed. There is no access to the top, like other well known buildings, but we did step into the lobby and check it out. It was very well appointed, from the floor to the walls to the ceiling. 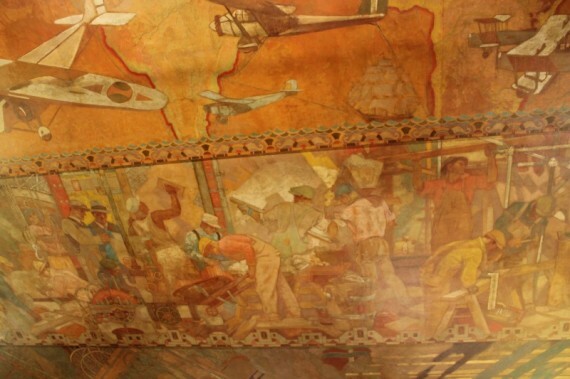 The ceiling in particular was gorgeous, as it was decorated with scenes of industry and commerce. From the Chrysler Building, we hopped on the subway to Brooklyn. Miles was intent on visiting Brooklyn and this seemed like the time to do it. Our tour guide from Tuesday had highlighted an area to walk around, and we took his advice. 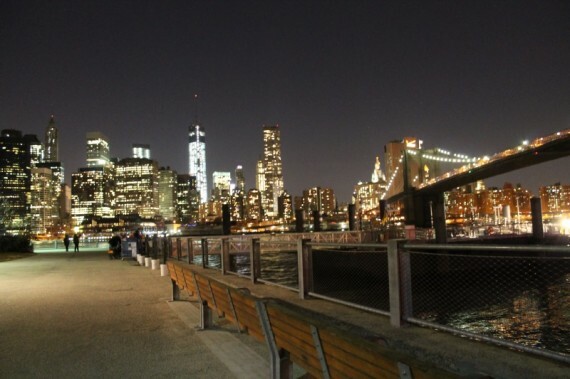 We walked around the Brooklyn Bridge Park, which was right on the waterfront. There was not that much foot traffic, but there were some tourists and there were even more runners. We were very hungry by this point and decided to grab something to eat in Brooklyn. 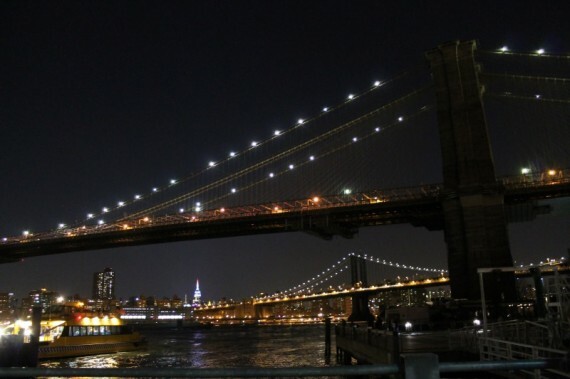 Luck would have it that Miles had been told by one of his tour guides that the very best pizza in New York was in a place under the Brooklyn Bridge. And we found it. There were actually two pizza places side by side, and the same man had founded both of them – Patsy Grimaldi. Due to some bad business deals, Patsy no longer had the rights to the pizza place that bears his last name – Grimaldi’s. 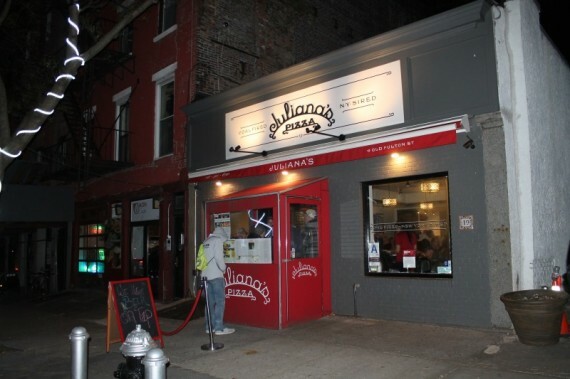 So he opened up a new place next door and used his mother’s name – Juliana’s. Ironically, the line outside Grimaldi’s was probably 30 to 40 people deep. And the temperature was in the 30s! We were able to get a table inside Juliana’s within 10 minutes. As a matter of fact, we had stepped outside the restaurant to wait, and Patsy Grimaldi himself brought us inside. Not knowing what to get, we asked the waiter for his recommendation. He advised that we buy two small pizzas, one covered in sausage (a Frank Sinatra favorite) and the No. 1 special. Both of these pizzas were fantastic, and the No. 1 in particular. It featured some smoked cheese and it was beyond words. 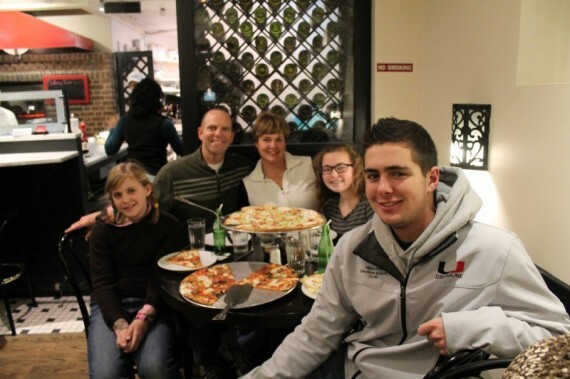 Miles said it was not only the best pizza he had ever had, but maybe the best meal he had ever eaten. That is high praise from a 16-year-old. 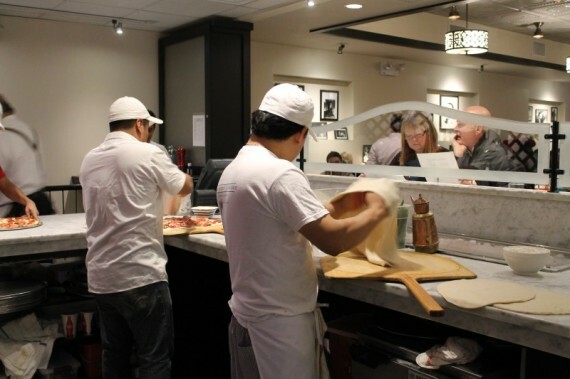 The pizza is made in a coal-fired oven that reaches 800 degrees. Patsy was an old-school kind of guy and he spent most of his time working the room. He did stop by our table at one point and ask us where we were from and asked about our meal. I told him that Miles had performed in the parade and he asked Miles what he played. Patsy told us that he played the trumpet, and he did that in the Army Band. He was very personable and his visit only added to our enthusiasm for our dinner. Highly recommended! Our waiter was also an old-school guy who was not afraid to speak his mind. Stephanie declared that he must be the only Republican in New York. He went off on Obamacare and free enterprise. He would get so mad, he would start spitting. I don’t know how we got him started on that topic, but leave it to us. After dinner, we made our way back to Penn Station via the subway and then rode the train to Secaucus. We were able to secure a ride from KK when we arrived. He needed to visit the local Wal-Mart so we went along with him. Let me tell you – the people in Secaucus have it rough. When you walk out the front door of their Wal-Mart, you have a great view of the Empire State Building. From those of us who only have a view of the Indian Smoke Shop from our Wal-Mart, let me tell you that great views are not normal. 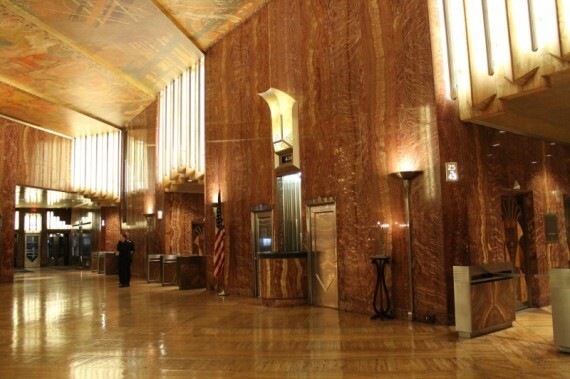 (Just catching up on the news) – Props from the Chrysler guys for the Chrysler Building visit & plug!